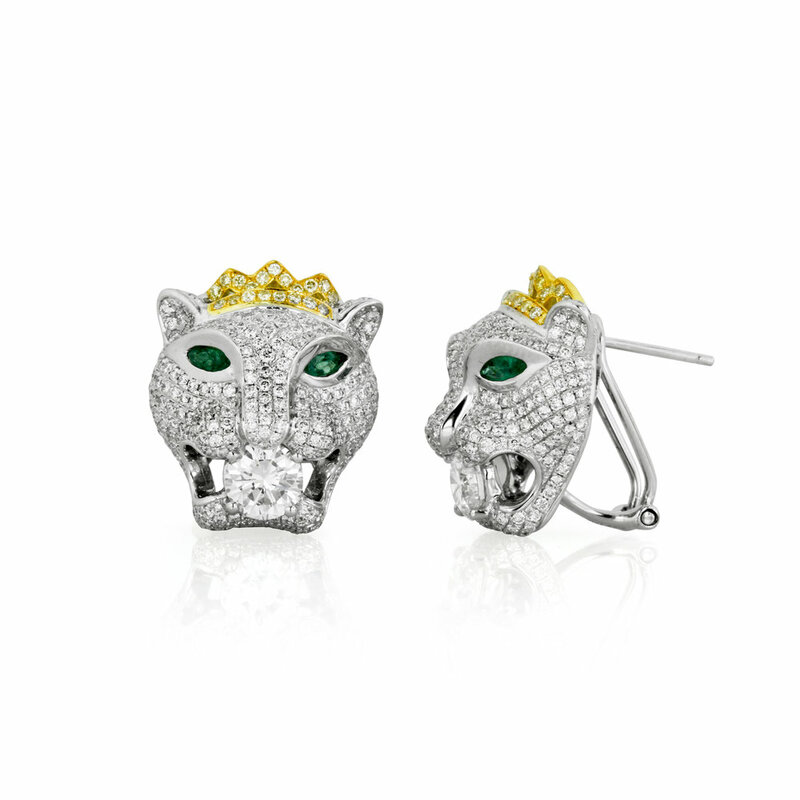 Like many of Ashley Morgan’s bespoke pieces, these white gold leopard earrings with their emerald eyes and their white and yellow diamond-studded faces are rich with meaning. To identify with the leopard as your spirit animal is to imbue yourself with the qualities of the leopard. The leopard is a powerful spirit animal. Leopards stalk silently, confidently. They use their precise vision and senses to stay alert and alive. They are independent, free, and majestic. Rough roads will come and go, but all can pass easily underfoot when faced with the bravery and instincts of the leopard. The back of these earrings is an intricate honeycomb pattern. This too has a deep meaning behind it—the honeycomb is the center of the bee community. It is this waxy series of channels and rooms that allows the bees of the hive to keep their queen safe within. This represents the wearer being safe within her own network of friends and family. The combination of the meaning behind honeycomb fused with the qualities of the leopard as a Spirit animal lead to a timeless design that is not only a representation of safety, but of a a strong set of qualities that are ideal for facing the world head-on.